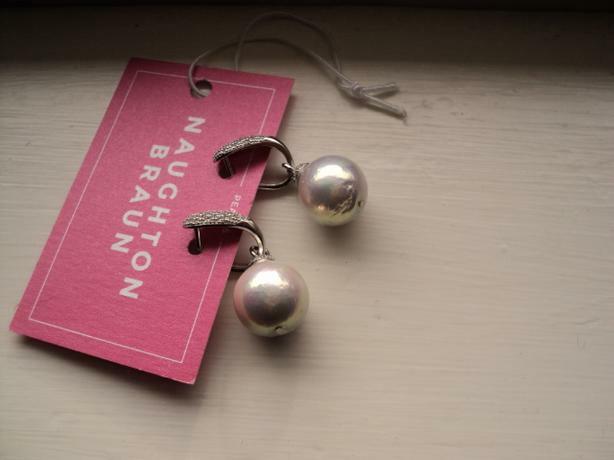 These are from Naughton Braun in the U.S. and are brand new - I haven't worn them. They are $300 US and I paid taxes, duties and brokerage fees on top of that. This color is "Ice". They are perfect as bridal earrings, but also for evening wear. Freshwater Edison Pearls, Sterling Silver, and Cubic Zirconia. Here's the description (but I've also included the website link fyi). Please include a local phone # if you'd like to see them as I don't text. Thanks. "250.00 Guaranteed to captivate, Naughton Braun brings you these bejeweled Sterling silver Edison pearl earrings, radiant with colored CZs and subtle lustre. Featured in Naughton Braun - New Beginnings Holiday Lookbook"